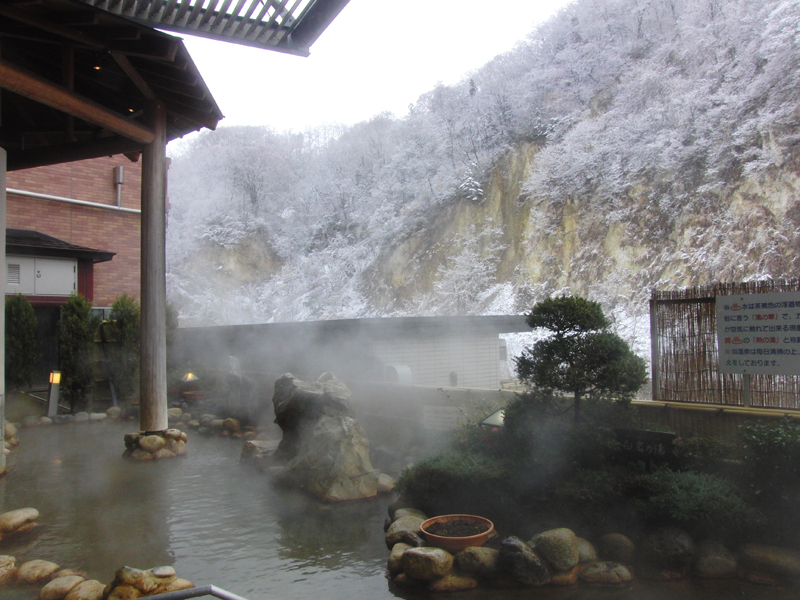 Uruoikan is a hot spring facility in Nagano City, next to a rocky hillside and the Susobana River. 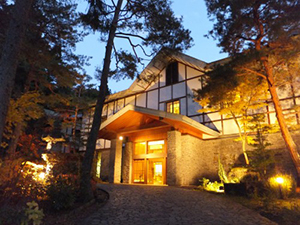 The onsen is a 100% natural onsen and has outdoor and indoor baths, saunas, and eating options. You can also treat yourself with massages, facials, steam treatments, and more! 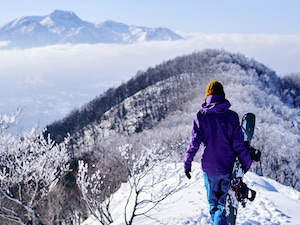 The view from the outdoor onsen is beautiful in every season. 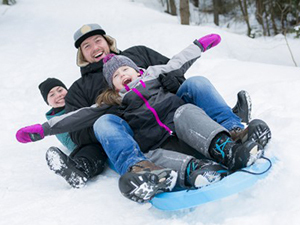 Just see the photo below for an impression of the winter scenery. In autumn, the trees are colored golden and red, spring sees the leaves colored a fresh green, and summer has rich green trees with cicadas chirping. 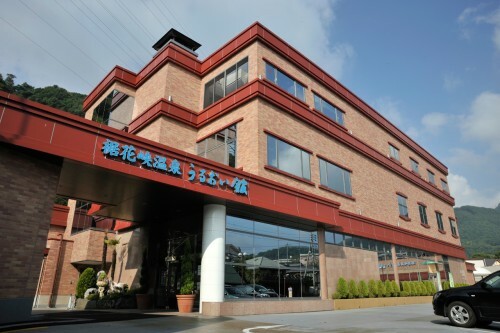 The onsen facility has two main sources of volcanic water that create the two different sorts of baths. One of the sources is used for outside baths. This water is red-colored and salty, and is said to heal you from neuralgia, muscle pains, relieve you from fatigue, hemorrhoids, intestinal problems, and many more. The inside baths are made up of phosphorous, salty water and clear-colored. The water is said to have skin-clearing properties and helps against chronic women’s diseases, diabetes, and cuts. 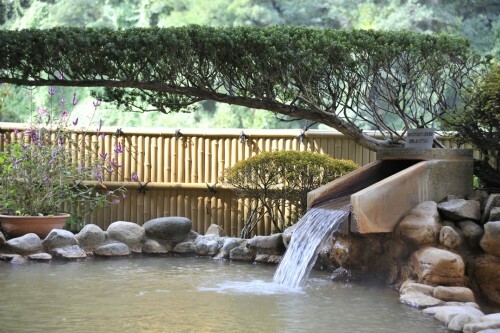 This onsen has a Korean-style sauna, a waterfall that streams down ones back, a whirlpool, and a mist sauna. 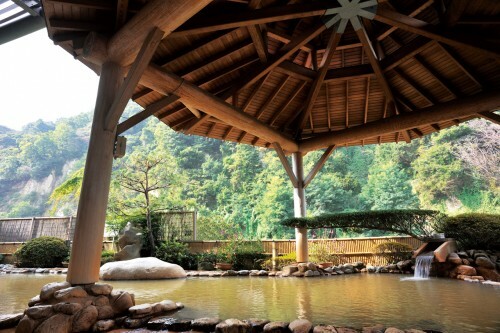 This onsen has a high-temperature sauna, a onsen with lying facilities, a waterfall that streams down ones back, a Korean-style sauna (for which you need a gown to wear, available against extra fee). If you are not too comfortable being naked in front of strangers, or you have a large tattoo that cannot be covered up by the tattoo seal, you can try the private hot spring of Uruoikan. 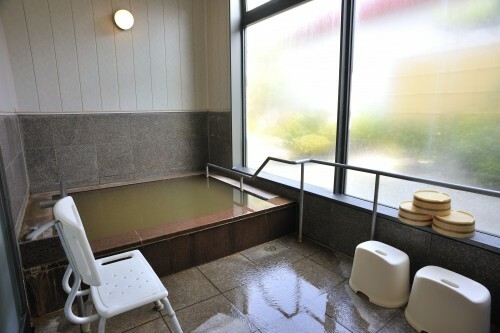 You can hire a private indoor onsen for an hour which will cost you 1500 JPY. It is available from between 10:30 and 23:00. 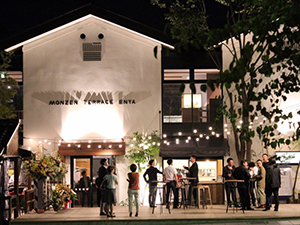 Adults: 670 JPY for between 10:00 to 21:00 on weekdays, 720 on weekends, 460 JPY for between 6:00 to 9:00, 510 on weekends, 510 JPY for between 21:00 to 23:00. Uruoikan has a restaurant on the second floor which opens from 10:00 to 22:00. The restaurant overlooks the river and cliffs and offers food like ramen, soba, curry, and even fries for those wanting something familiar. 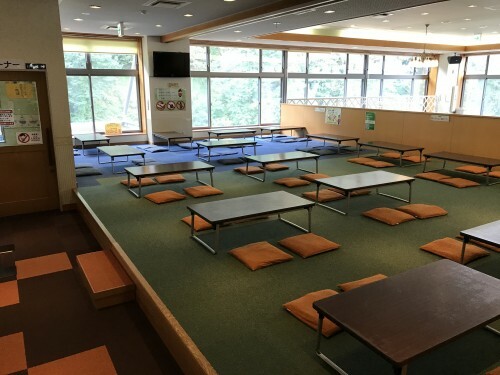 Besides the restaurant for full-blown meals, there is a bakery on the first floor. They also serve coffee and ice-cream besides the various breads. This store opens from 7:00 to 22:00. Since most of the visitors to the onsen are locals, and locals generally have strong feelings about tattoos, people with large tattoos are not allowed to enter the hot spring facility. If your tattoo is only small, about palm-size, you can get a tattoo seal to cover up at the front desk of the building. Then you’re ready to get into the hot spring baths. 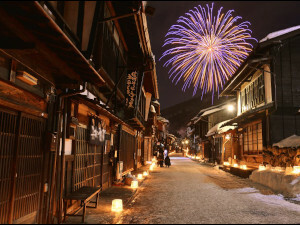 Read more information about onsen rules and etiquette here. 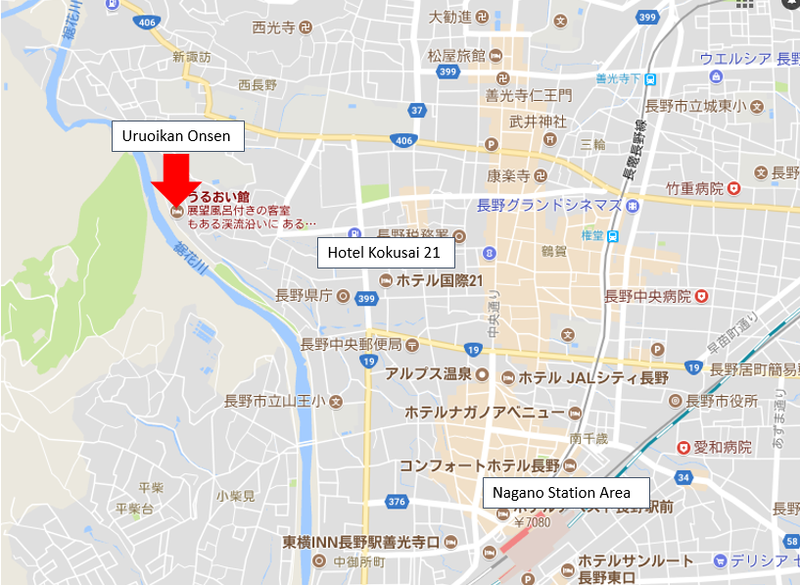 If you’re staying in hotels in the center of the city like Kokusai 21, you can easily get to the onsen within 10 minutes on foot. 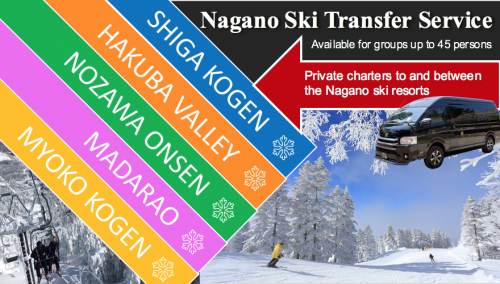 Hotels close to the station are not that close by but might have a shuttle bus to the hot spring available. 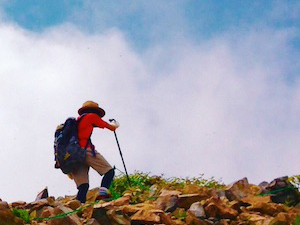 Best is to inquire directly to the hotel.